Do you feel like you should be drinking more water, but just can’t seem to? If so, there might be something in the water that’s turning you off. Good water is that clear liquid that looks transparent and doesn’t make you sick immediately, right? In every corner of the globe, we’re polluting, diverting, pumping, and wasting our limited supply of fresh water as population and technology grows. Click here to buy Blue Gold. It might be water, but that doesn’t mean it’s good. Don’t judge it by the way it looks. It may contain clear odorless poisons such as chlorine, fluoride, arsenic, mercury, prescription drugs, and many other toxins that can eventually cause a slew of side effects and lead to disease. Because small traces of such poisons can accumulate over time, it’s difficult to pinpoint the cause. It’s no wonder some people say they don’t like water. When you don’t like the taste, trust your gut feeling and don’t drink it. Or better yet, use your water tester to check the purity. The purer the water, the better it tastes. And you’re less likely to ingest invisible particles that may harm you. A good water filter is the most essential appliance in your kitchen, but a water tester is the most important gadget in your purse or laptop bag. For just a few dollars, you can make a big investment in your health. If you have to choose between the two, start with a tester. 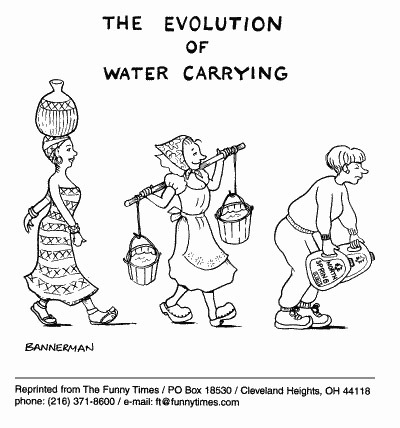 I first learned about testing water when I lived in Shenzhen, China. One of my expat friends urged me to test the water before drinking it. Since it was such a small investment, I decided to get one. I quickly got into the habit of checking water everywhere I went. I was surprised at how much it varied from place to place. According to the manufacturer, 50 and lower is safest to drink. In Shenzhen, I typically got readings from 20-180. At this time, I was shocked when I saw readings in the high 100’s. But then my husband and I traveled to Indonesia, known for some of the dirtiest water in the world. The bottled water at the Ritz-Carlton in Jakarta tested at 284! I thought that was shocking until we took a trip back to the US. When we arrived at Dallas airport, I tested the table-top water dispenser at the American Airlines Admirals Club. It was just as high as the water in Jakarta! For the past several years, I’ve been carrying a water tester with me in my purse wherever I go. 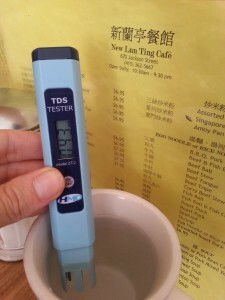 I use my HM Digital TDS tester to check the water before deciding whether or not to drink it. It only takes a few seconds. I turn it on, dip it in the water, and get an instant reading. I never know what to expect. I was pleasantly surprised when I tested the water recently at New Lun Ting Cafe in San Francisco. It had a reading of 43. Compared to local tap water, that’s not bad. The closer to zero, the purer the water. I asked the waitress about it and she told me what I expected. “We have a water filter,” she told me. Feel free to check out some of my Yelp reviews for specific readings at various locations. I don’t want mystery particles swimming around in my body! Think about how often you drink liquids outside your home. If you travel or eat out frequently, you can use a tester to check the water you use for drinking, cooking, and even bathing. It can help you decide whether or not you want to want to make a cup of tea, order soup at a restaurant, or fill up a bathtub and soak in the water. You’ve probably heard before that your skin is your largest organ. It absorbs the water you bathe in. Since you can’t see all the sh*t that’s in your water, so wouldn’t it be nice to have a gauge to help you give you a rough idea how much sh*t it might contain? Your body is made up of more than 50% water. It carries oxygen and essential nutrients throughout your body. You need water daily to flush pesticides and other impurities out of your body, not put more in. Wouldn’t it be nice if you could actually see all the sh*t that’s in your water? 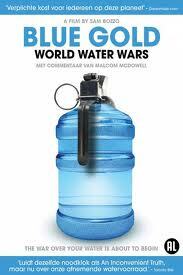 Don’t assume that bottled water is better or worse than other water. Once you start testing various water sources, you’ll be shocked at how much readings vary from one bottle to another, one restaurant to another, and even one building to another. What do you call people who spend $2 for a bottle of Evian water? Just spell Evian backwards: N A I V E.
Clean water is one of the most essential elements to sustaining life, second only to oxygen. You can live without oxygen for 2-5 minutes, and without water for only 2-5 days. If you don’t already have a portable water tester, I urge you to buy one today so that you can start making an informed decision about the water you choose to drink. Water is the only drink you really need. Before you leave home, check to make sure you have your keys . . . and your water tester.